This fall, 152 new Public Price Promise scholarship recipients began classes. (THOUSAND OAKS, Calif. – Oct. 29, 2015) California Lutheran University is expanding its popular Public Price Promise program to match the costs of a sixth University of California campus. The scholarship program provides a private school education at a public school price. The Public Price Promise scholarship now will be available to freshmen and transfer students entering Cal Lutheran in the 2016-2017 year who were also accepted to UC Irvine. The program will continue to be available to Cal Lutheran students who were also admitted to UC San Diego, UCLA, UC Santa Barbara, UC Davis or UC Berkeley. 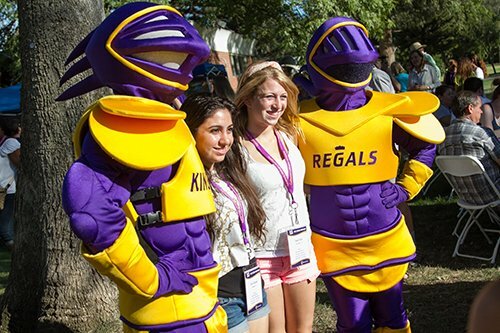 These students can attend Cal Lutheran for the cost of attending a UC. For the 2015-2016 year, the value of the scholarship is $23,424. The amount is slightly more than the difference in the tuition, fees, books and living expenses for full-time residential students attending Cal Lutheran, which is currently $57,641, and the average price of attending the UC colleges, which is $34,218. The 2016-2017 scholarship award amount will be announced in spring after the universities have set their tuition and fees. Since the program’s inception in 2008, 1118 students have received more than $20 million in scholarships. The number of students entering Cal Lutheran under the program each year has increased more than sixfold from 2008. This fall, 152 new Public Price Promise scholarship recipients began classes. The program was designed to show students who thought they could only afford a public university that an education at a private school with smaller class sizes and lower faculty-student ratios was within reach. It has led other universities to adopt similar programs. The Public Price Promise is open to all students applying for the traditional undergraduate and Bachelor’s Degree for Professionals programs. It has no income requirements and it is open to out-of-state and international students as well. Students can also receive federal, state and institutional aid based on need to further reduce the cost. If students make satisfactory academic progress and meet GPA requirements, they can renew the scholarship each year. The award amount increases if the difference in the cost of attending Cal Lutheran and a UC goes up. Students entering as freshmen can renew the scholarship for four years, and transfer students can receive the scholarship for a maximum of two years depending on their grade level at enrollment. Of the students receiving the Public Price Promise scholarship this year, 33 percent are first-generation college students and 29 percent identify themselves as Latino. Cal Lutheran is a selective university based in Thousand Oaks, California, with additional locations in Woodland Hills, Westlake Village, Oxnard, Santa Maria and Berkeley. With an enrollment of 4,100 students, Cal Lutheran offers undergraduate and graduate programs through its College of Arts and Sciences, School of Management, Graduate School of Education, Graduate School of Psychology and Pacific Lutheran Theological Seminary. Members of the Cal Lutheran student body come from across the nation and around the world and represent a diversity of faiths and cultures. For more information, visit CalLutheran.edu/promise or contact the Office of Undergraduate Admission at 805-493-3135 or admissions@callutheran.edu.